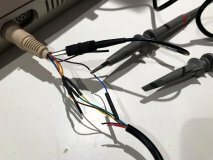 Design an adapter to connect an original NES Zapper to a Tandy 1000 EX PC. 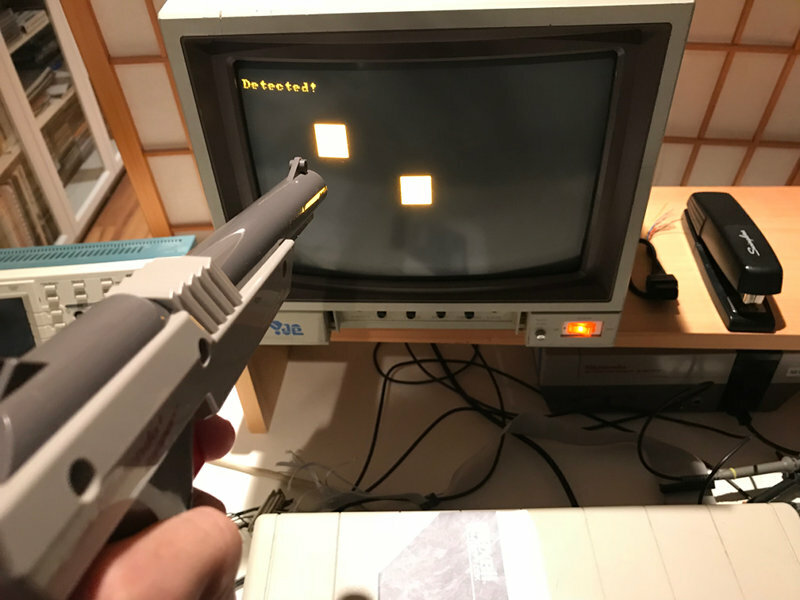 Code a Duck Hunt clone and/or an original mini-game if I find inspiration. 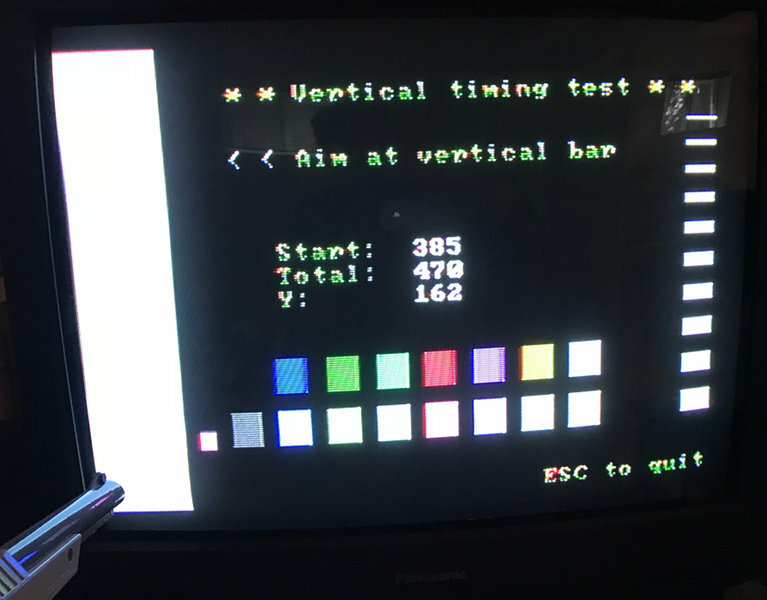 Also support CGA 320x200 video, and test the game on my XT-clone with a CGA card. 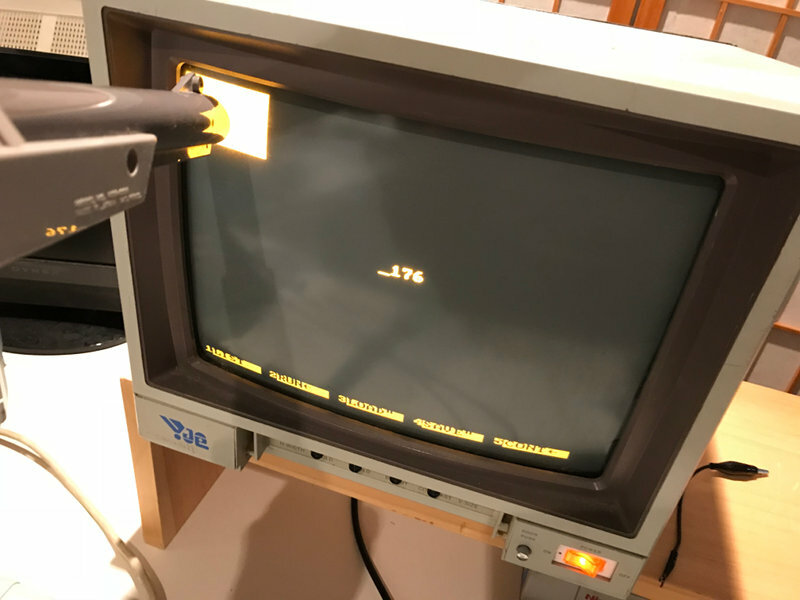 Experiment a bit to find out if an unmodified Zapper can also work on a VGA monitor. TLDR? I met all my primary goals, and almost all the secondary ones (CGA version not ready yet). 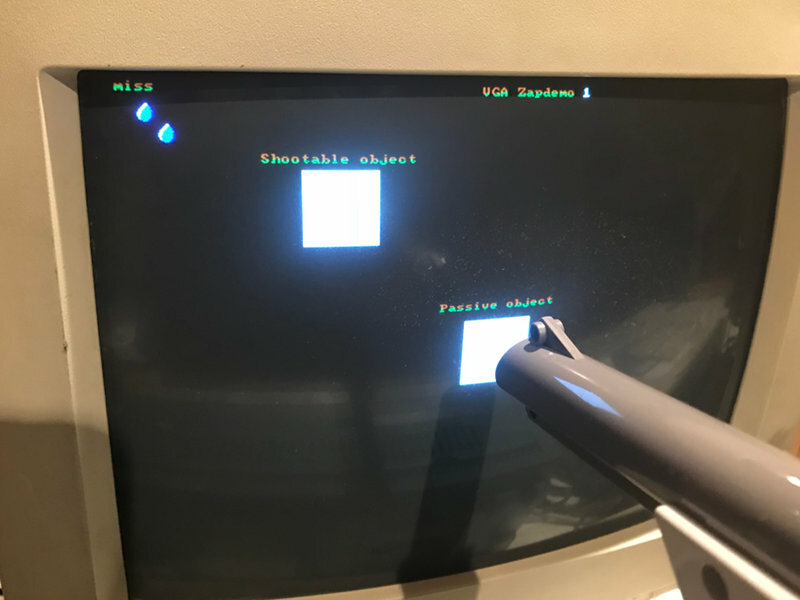 Also, I have confirmed that the Zapper can work on a VGA CRT (Cathode Ray Tube) monitor, and a VGA version is in progress. At the time personal computers were a new thing, decicated video monitors were expensive. 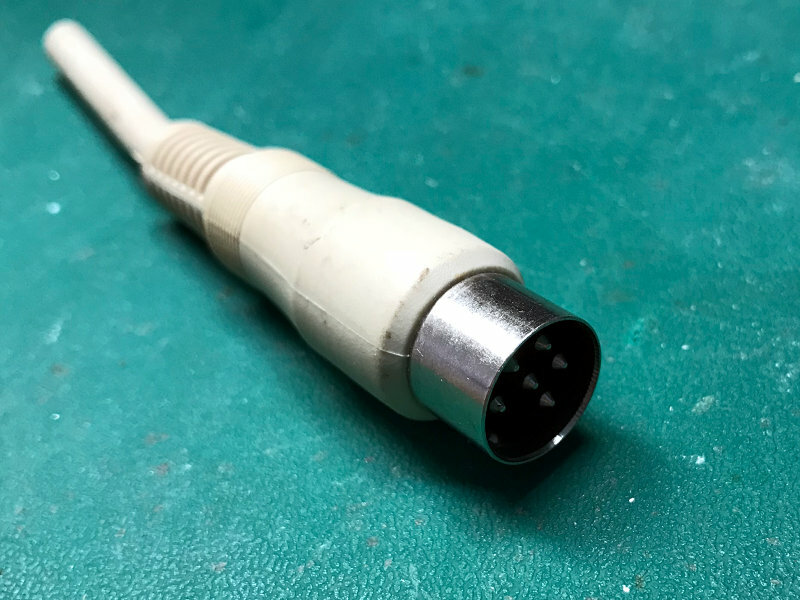 Composite video output was therefore a common feature on early PCs, so users could conveniently use the TV they already owned. 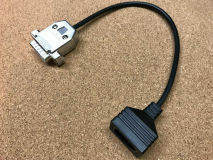 Just like for video games consoles. 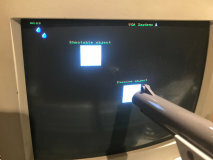 Computers such as IBM PCs had composite video output on CGA cards, but limited graphical capabilities (4 colors) and no joystick ports, unless an expansion card was installed. 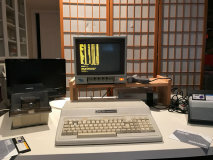 On the other hand, computers from the Tandy 1000 series (from 1984) offered 16-color graphics, two built-in game ports and enhanced sound hardware. Much better suited for video games! 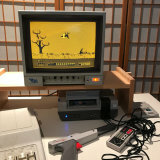 The NES came out in 1985 and as everyone certainly knows, it also connected directly to TVs. 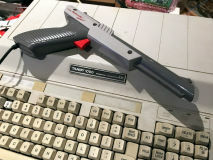 The NES also came with a light gun accessory known as the NES Zapper, which worked by detecting light emitted by the screen. 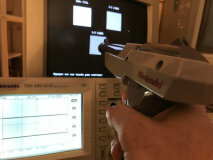 To avoid interference from other light sources in the room, the NES Zapper is tuned for TV displays operating at a ~60 Hz vertical refresh rate, and ~15 kHz horizontal refresh rate. For RC2018/04, I'd like to try to make the required Zapper adapter and code a game that uses it. 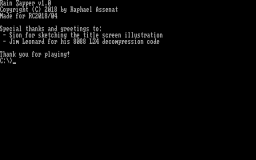 For the game itself, I will reuse the graphics library and tooling I made for RATillery. 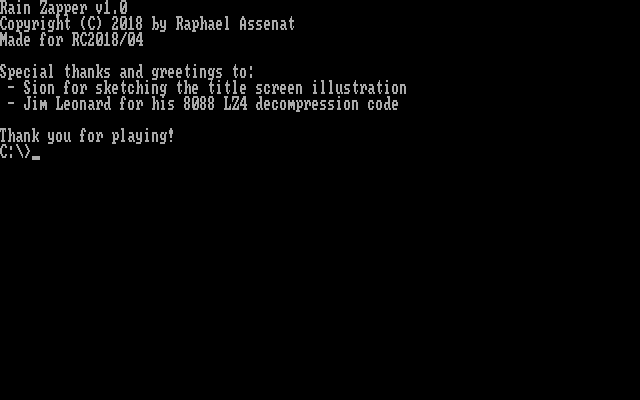 But the game code itself, the graphics (and music if I get there) will be new material created from April 1 to April 30 as per the RC2018/04 rules. If I have time (and if I don't, I'll probably do it later anyway) I would like to test a theory. 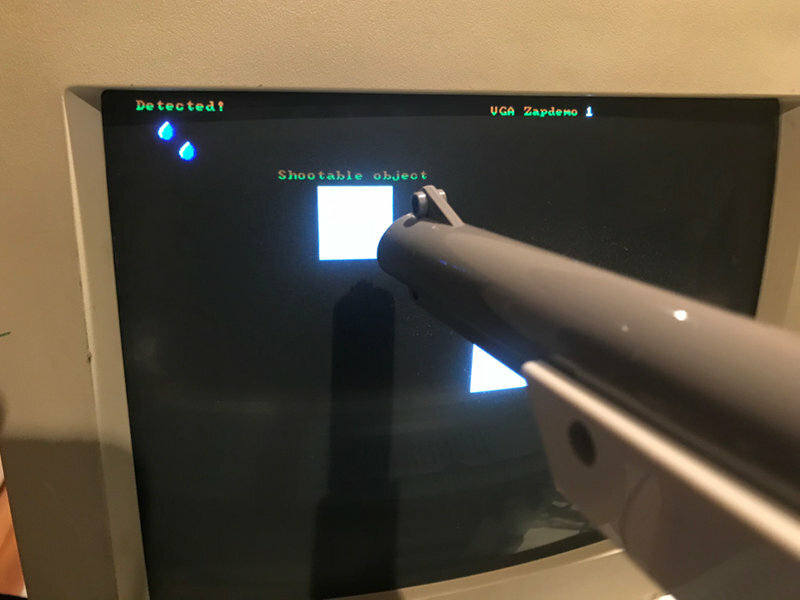 Because most VGA monitors do not support horizontal refresh rate of 15 kHz (too low), the Zapper probably cannot be used (will test to confirm). But then, I think there is still a way to use an unmodified Zapper with a VGA monitor and I would like to give it a try. 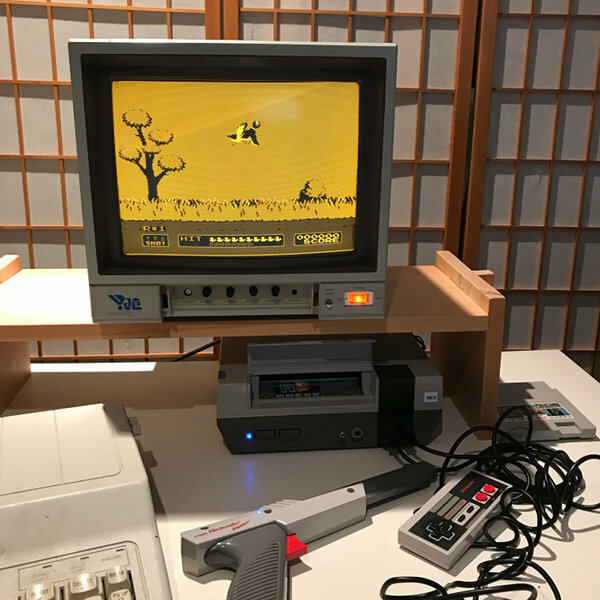 I first tested Duck Hunt to confirm that the Zapper still works and that it had no problem with the monochrome monitor I planned to use for the time being. (I plan to begin using the large color TV later). 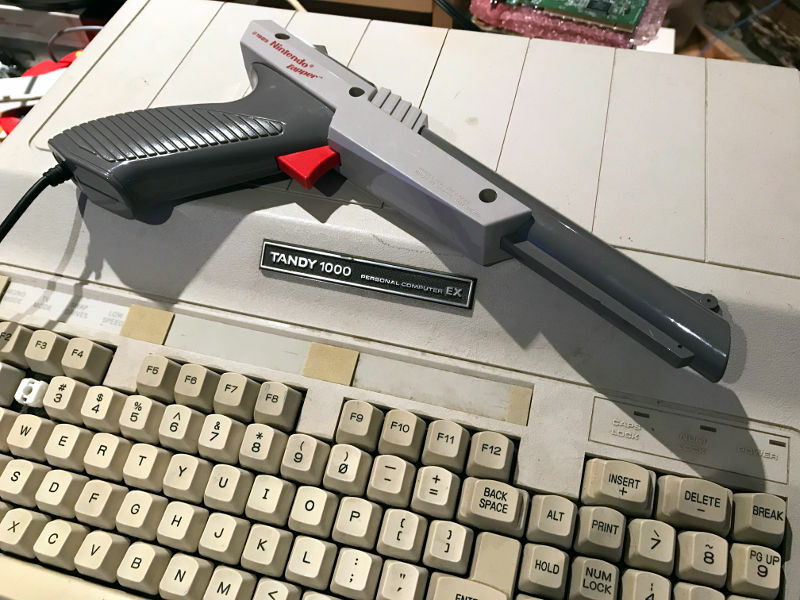 Duck Hunt worked fine, so I connected the Tandy 1000 EX and prepared a floppy for the project. 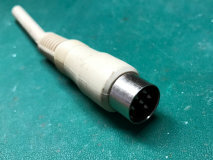 Next target: Building an adapter. 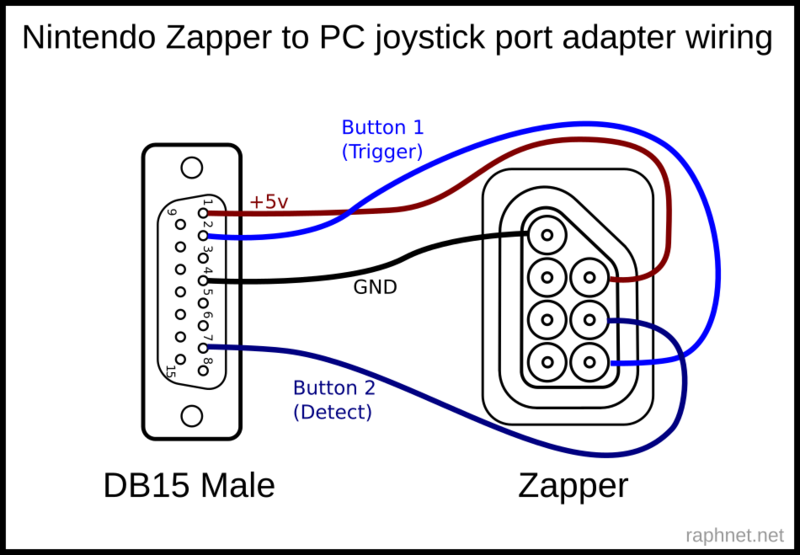 Using the joystick port was obvious due to the presence of a 5 volt output (to supply the Zapper) and two button inputs (one for the trigger, one for the light detect output). I was very careful to double check everything, I even probed the Tandy 1000 EX joystick port to make sure the 5v supply was where I expected it. 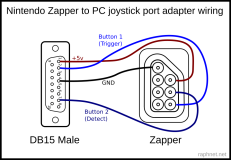 The state of the two joystick button inputs can be monitored by polling port 0x201. The two significant bits reflect the button state. I wrote a simple basic program displaying the value from port 0x201. I arranged for a blinking white rectangle to be present so I could point the Zapper at it and see the effect. 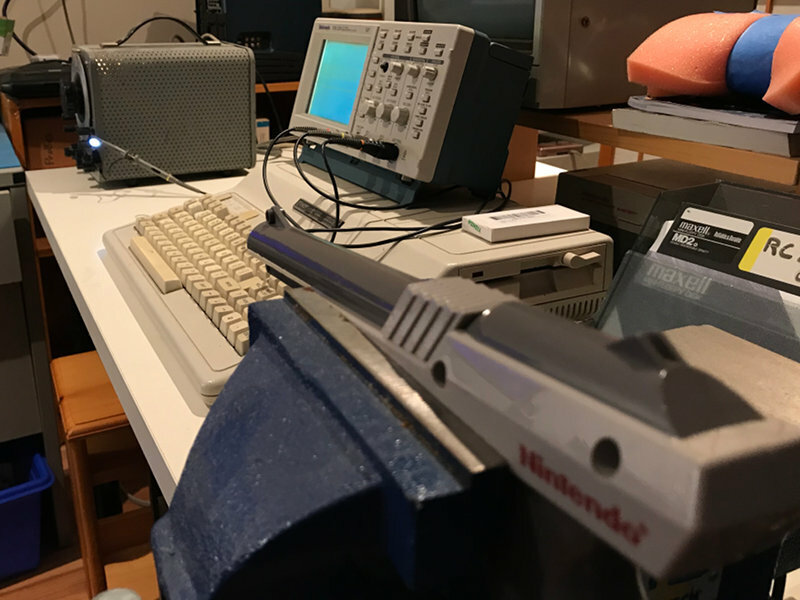 I also had a scope wired to the zapper detection output to observe its behavior and timing closely. So it worked! 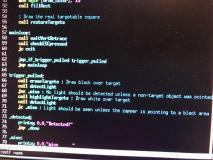 But light detection was not reliable. In the rightmost picture above (the one showing a white rectangle) the number 176 was only shown occasionally and briefly. 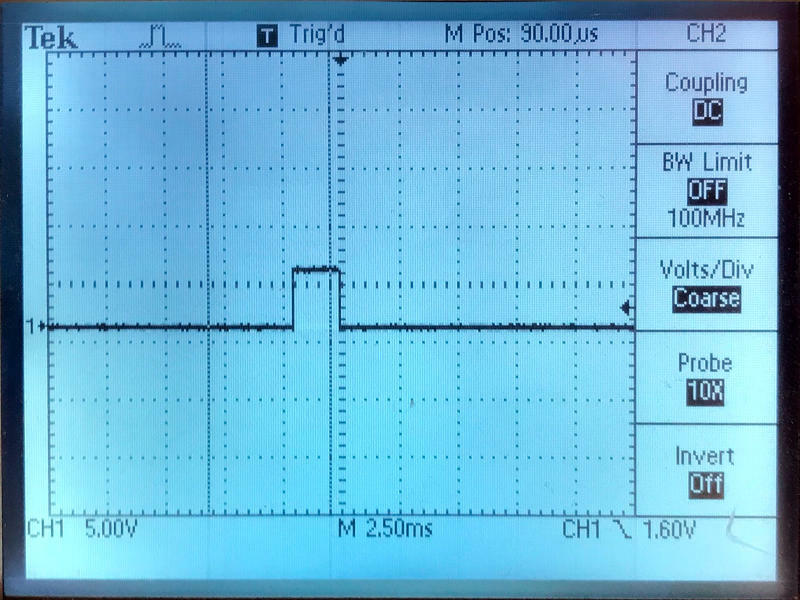 I looked at the output from the scope and saw that the signal went high for approx. 2ms. And after thinking about it, it makes sense. While our eyes does not see it, the block on the screen is never completely lit at once. The Zapper actually sees the beam drawing each new scanline as the previous one is already faded. 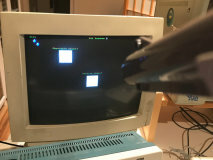 Once the beam is lower than the block, the zapper does not detect anything until the beam reaches the bottom of the screen and vertical refresh takes place (every 16ms / 60Hz). The code I had used so far was reading the IO port and displaying the value in a loop. Interpreted BASIC being already slow, writing numbers on the screen in decimal between each sampling of the IO port is obviously much too slow. 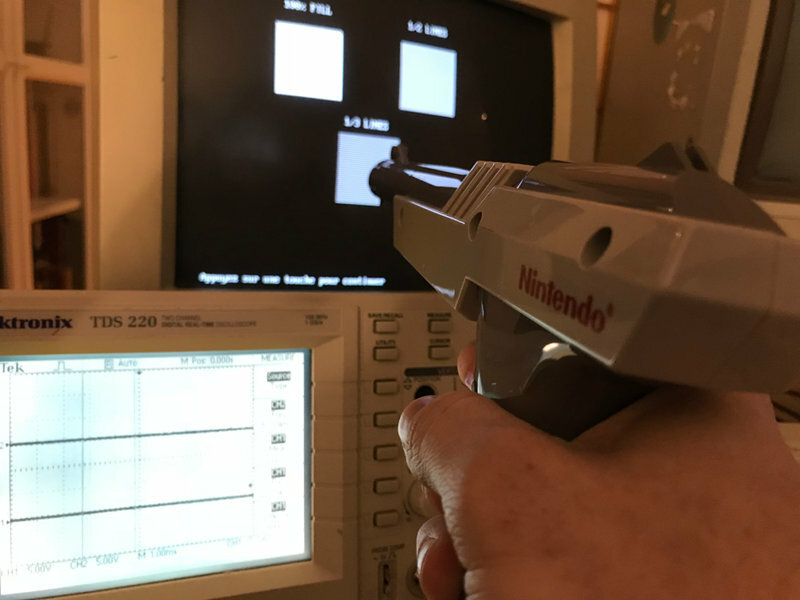 I made a new program that polled the port in a tight loop without screen updates, waiting for a trigger first (worked very well) and then waiting for light (using a loop as a timeout to detect misses). But it still failed to reliably sense pulses from the Zapper. 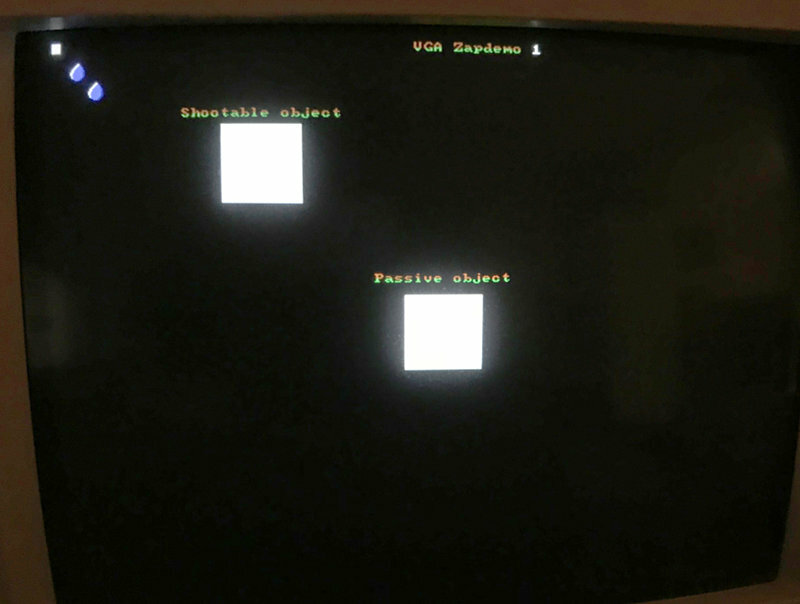 So detecting a 2ms pulse by polling an IO port in BASIC is probably impossible on this slow machine. But it does not matter, I was using BASIC only as a temporary convenience for quick experimentation. The game will of course be written in assembly. So the next thing I will do now is to implement a simple test in assembly, so see if it will be fast enough and reliable. 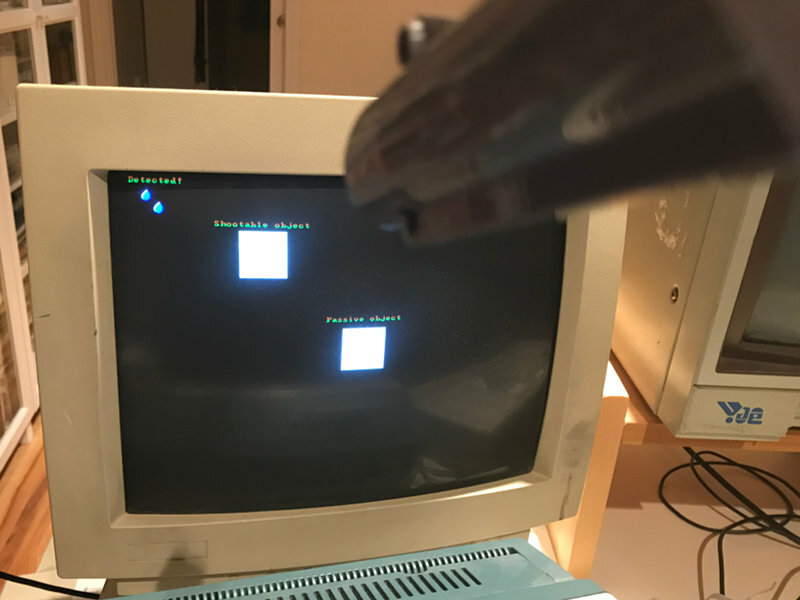 As planned, I redid the test in assembly language and now everything seems to work fine even though it is an incomplete implementation where one can easily cheat by aiming at non-black screen areas, or even by pointing the Zapper at another screen when pulling the trigger... But at least the feasibility of the project is now confirmed! 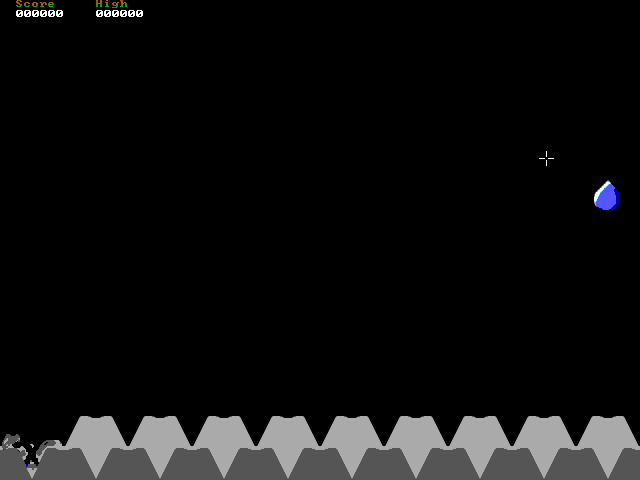 First pass: Draw a black rectangle over the target, confirming no light is seen by the Zapper during a first frame. 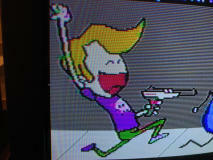 Second pass: Draw a white rectangle over the target, confirming light is seen by the Zapper during this second frame. Only shots meeting the two conditions, that is no light in the first frame followed by light in the second, shall be treated as hits. If there are several targets, drawing the white rectangles can be done in extra frames. 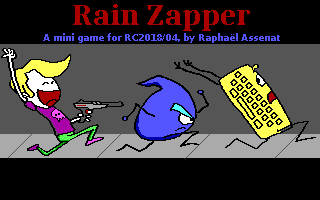 The exact moment where the zapper finally sees light again will depend on which target was hit. 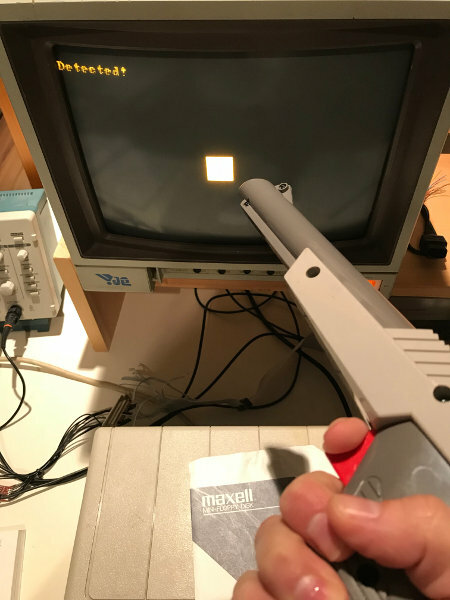 This week, still no sight of a game, but the basics are under control and I think I have a good grasp of the capabilities of the Zapper. I should have a playable demo soon! The "cheating" issues I wrote about in my previous update are solved as planned. Drawing black for one frame, white in the next, while monitoring the zapper to make sure its output follows exactly. Consider the pictures below: The square in the middle of the screen is not shootable (passive), while the one near the upper left corner is. Pulling the trigger at the former reports a miss, but shooting at the later is correctly recognized as a hit. An important concept for games, where shooting passive objects such as the scenery or score should do nothing. 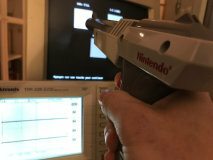 Of course, this technique causes flickering of the shootable object when pulling the trigger. 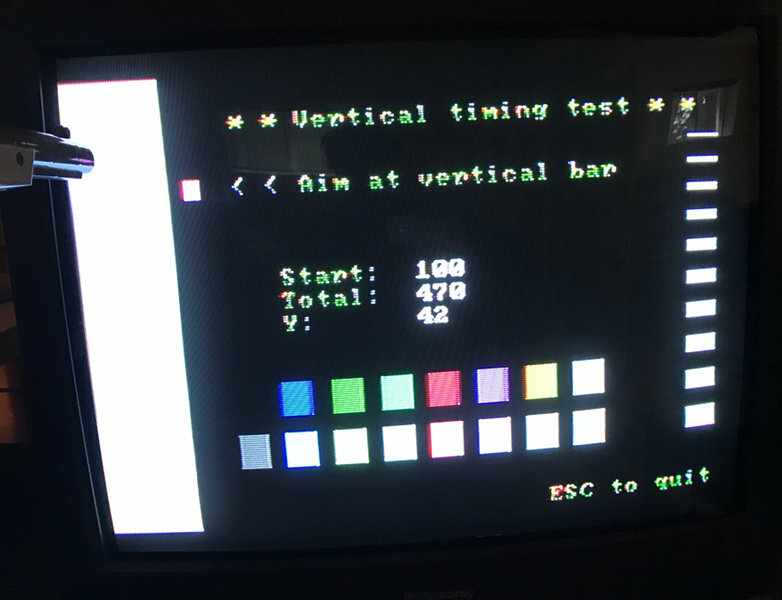 The simple detection test I wrote about last week waits for vertical retrace and then monitors the Zapper during the full frame. Why? Because the exact moment the detection pulse will come is not known in advance. It depends on the vertical position of the object being shot at. I wonder if some NES games used this technique, I have not done research on games other than Duck Hunt.. 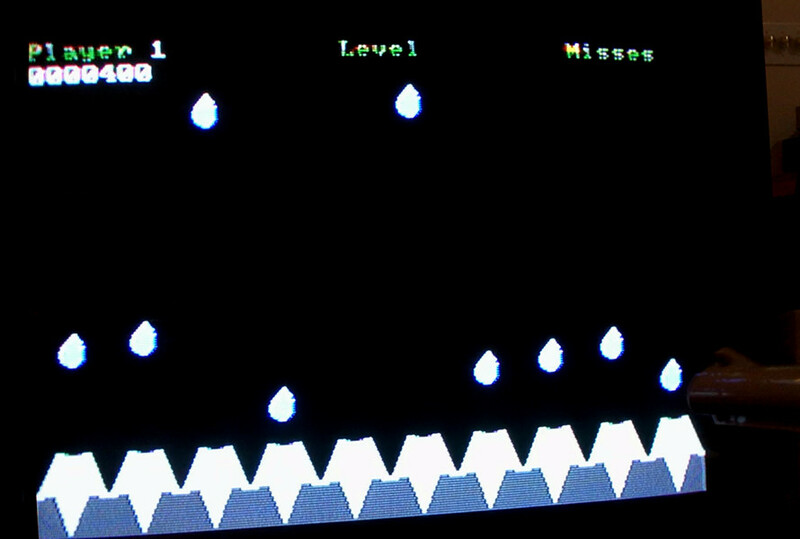 In any case, for a game with a great number of targets that are not vertically aligned, the process of drawing the targets in black (or blanking the screen) and then in white could be done in parallel rather than one by one. 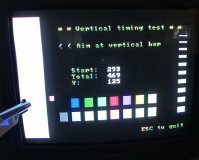 Also, on the right of the screen, the series of lines of increasing thickness was to test how many scanlines were required for detection. 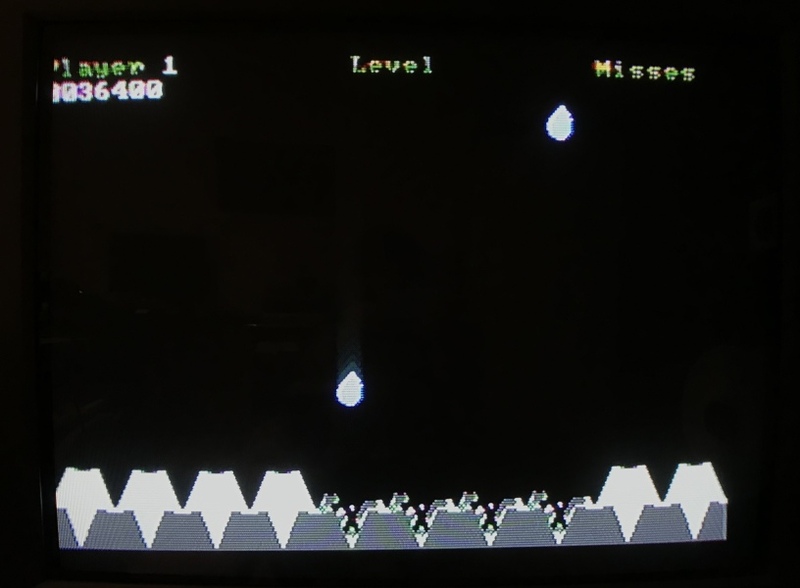 But it turns out even a single scanline is detected. These last few days, I spent time working on a first game concept. 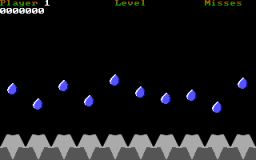 The player must protect his keyboard from falling water droplets. How? But by zapping them of course! 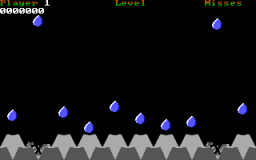 There are still a few missing features: The apparition frequency and falling speed of the droplets should gradually increase. 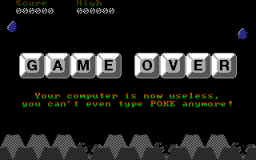 Once more than half of the keys are broken, it should be game over. The best score should also be memorized and displayed. I don't know how much I'll manage to do, but until RC2018-04 ends, I'd like to make at least one more game. Keyboard in 'mint' condition, nice! Four broken keys, almost done for! It is well known that the Zapper, at least the NTSC version, is meant to be used with a CRT screen with a vertical refresh rate of 60Hz and an horizontal rate of about 15.75kHz. 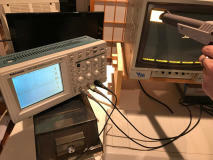 The standard 640x480 VGA mode meets the 60Hz requirement, but the horizontal frequency is almost two times higher at 31.46875 kHz. 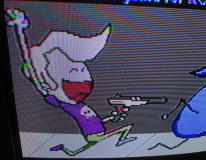 So at least in theory, this is not adequate for the Zapper. 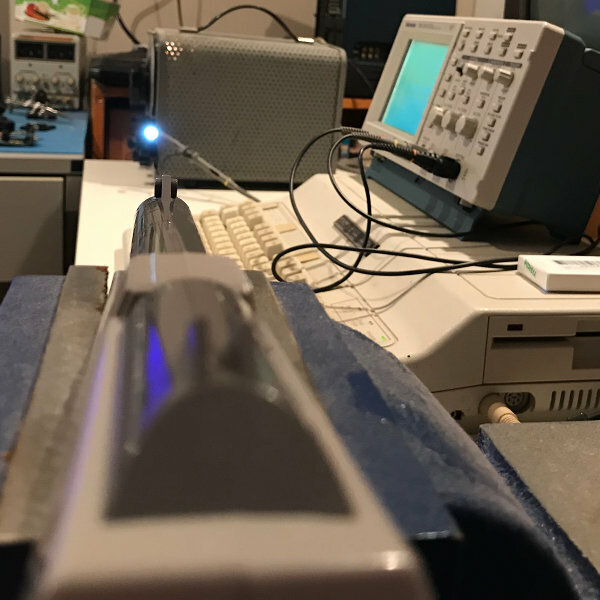 I found out that my Zapper, when exposed to a continuous squarewave of high amplitude, accepts frequencies from 1 kHz up to almost 74 kHz! But when I increased the distance from 1m to 3m, the maximum frequency fell to about 38 kHz. But still, as the VGA horizontal refresh rate of 31.5kHz did fall in the response range I had seen during my simple experiment, I pointed the Zapper at a VGA screen and looked at the scope for an output. Unfortunately, there was none. 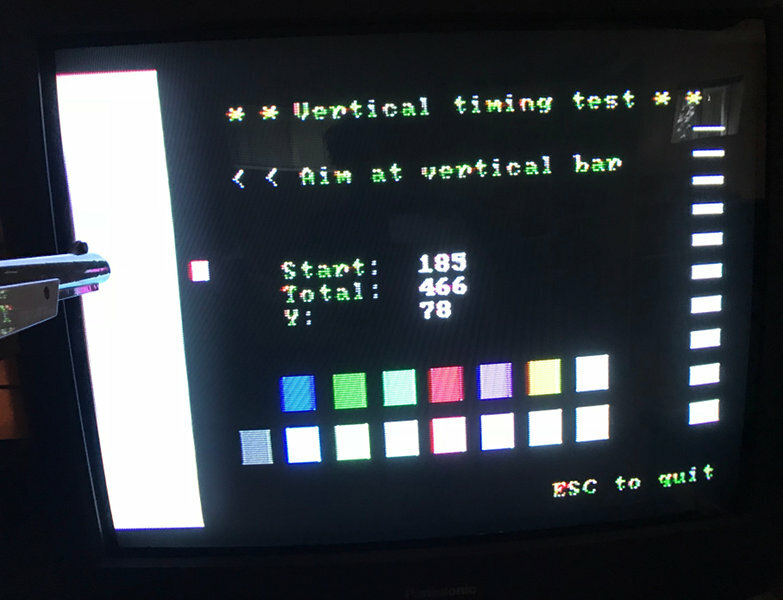 Even when aiming at a white rectangle on a screen in mode 12h (640x480@60Hz). Even though I had seen the Zapper accept a signal as high as 74kHz, it certainly did not mean that it's sensitivity at this frequency was equal to what it must be at 15kHz. 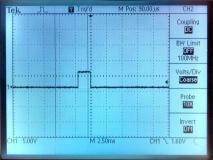 In fact, expecting a sensitivity fall as the operating frequency moves away from the ideal 15kHz is quite reasonable. 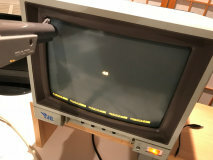 The VGA screen I used is not very bright, even with maximum settings. 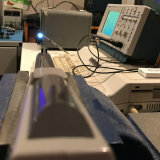 The light it emits, being very low if compared with the LED I used in the experiment, was probably not enough to trigger a detection at 31.5 kHz. 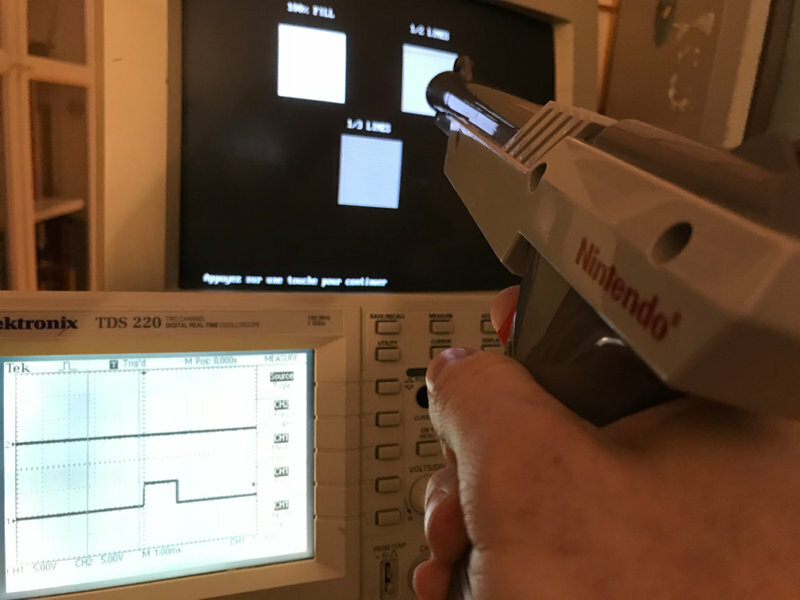 When the zapper is pointing to a white zone on a screen refreshed at 31kHz, the zapper sees short pulses spaced at approximately 32 microsecond intervals. 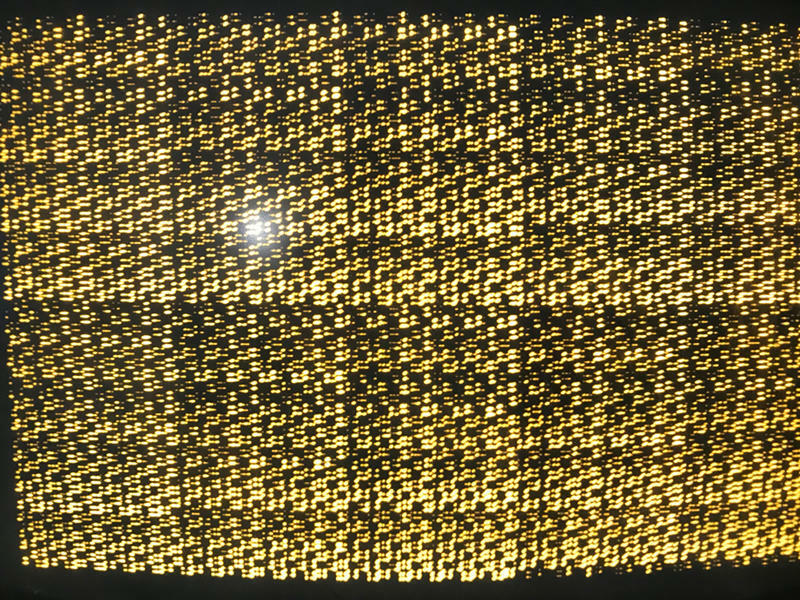 Each pulse is caused by the beam crossing the Zapper's "field of view", and repeated for each scanline. 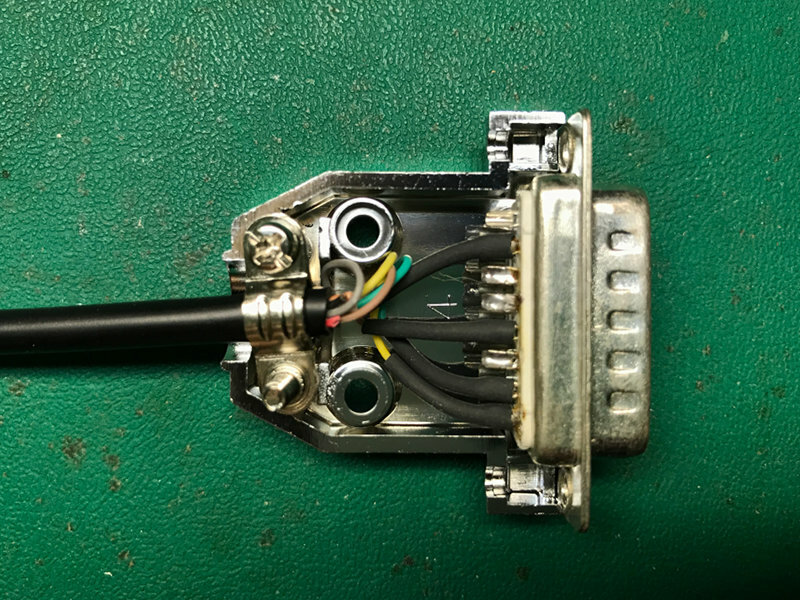 When a TV or CGA screen is used, there time between pulses doubles and becomes about 63 microsecond. In those conditions, the Zapper works well. 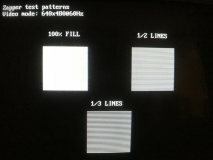 My idea was: "What if, in the VGA 640x480@60Hz mode, one were to draw odd lines in black? 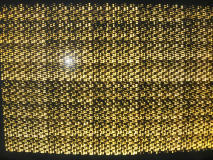 The zapper would only see even scanlines, and therefore the time between pulses would double and become 63 microseconds! As seen on TVs!" It seemed likely to work. 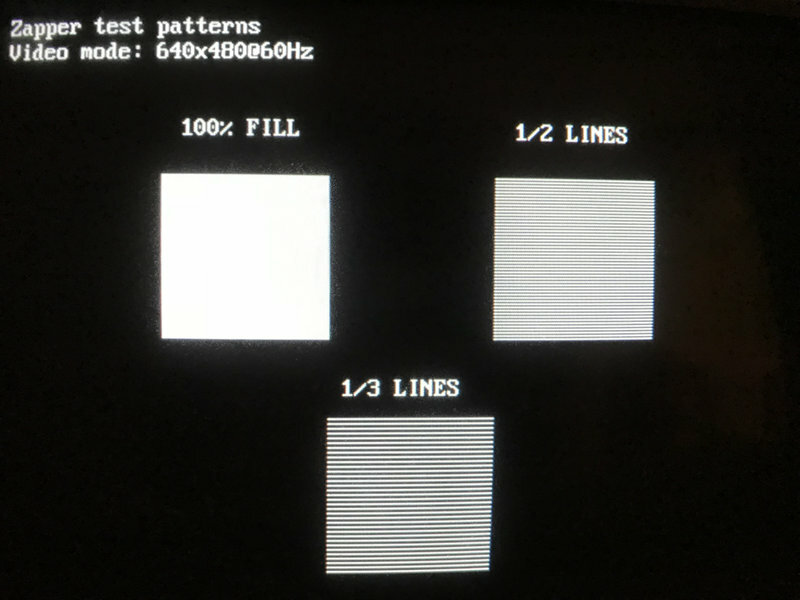 So using QBasic, I entered graphics mode 12 and drew 3 test patterns: A first one in full white, a second one with only 1 out of 2 lines in white, and a last one with only 1 out of 3 lines in white. 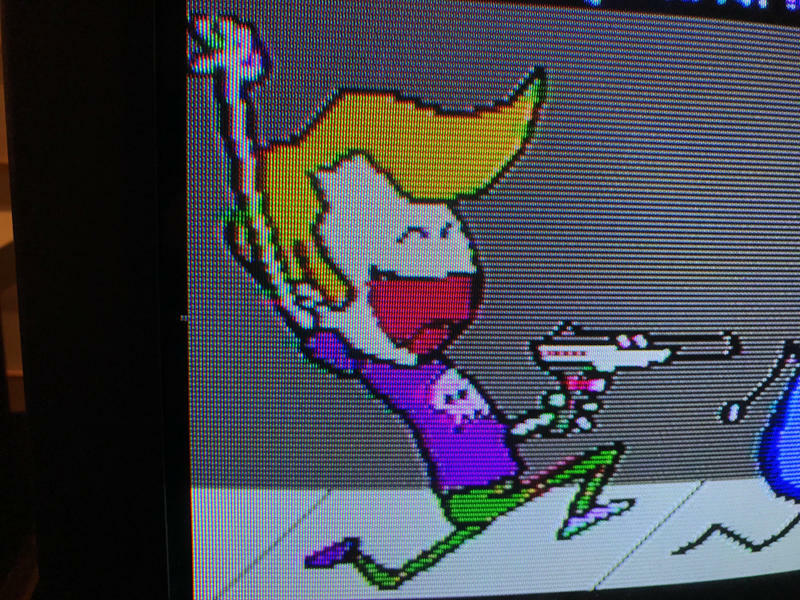 As I aimed the Zapper to the different test patterns, I kept an eye on the scope to see if something was happening. No reaction on the white and 1/3 patterns, but on the 1/2 pattern, there was an output! Hurrah! 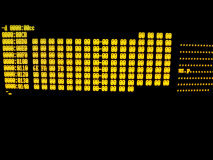 1/3 test pattern. No pulse. 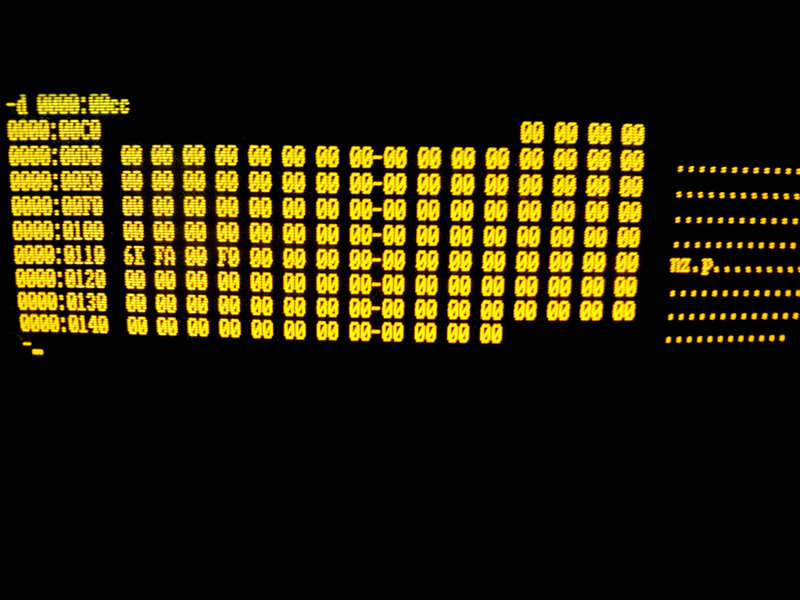 1/2 test pattern. It works! 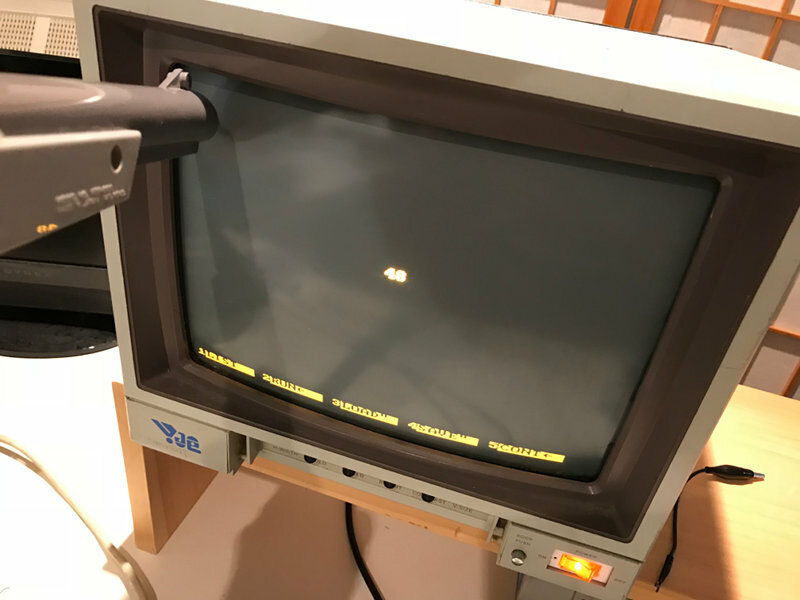 Given the encouraging results of the tests I had done two days before with a CRT VGA screen, I built a Zapper to PC DB15 adapter so I could confirm with a complete chain (Zapper + PC + VGA CRT). 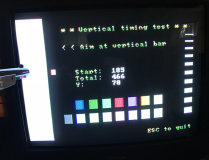 I spent some time updating my graphics library to support the standard VGA 16-color 640x480 mode (By the way, I had no idea VGA programming was so fascinating!) and I modified one of my previous test programs (see April 15 section for original). 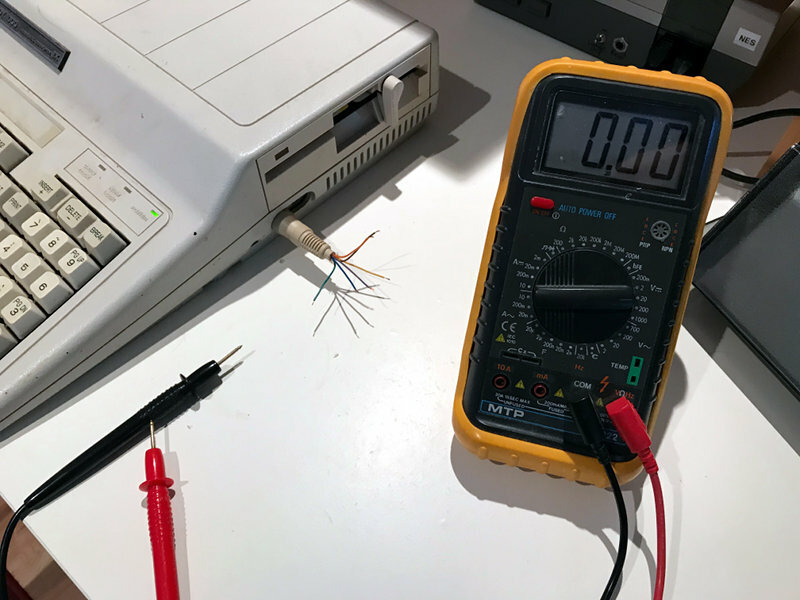 Then I connected the adapter and started the test. Reminder: The square in the middle of the screen is not shootable (passive), while the one near the upper left corner is. 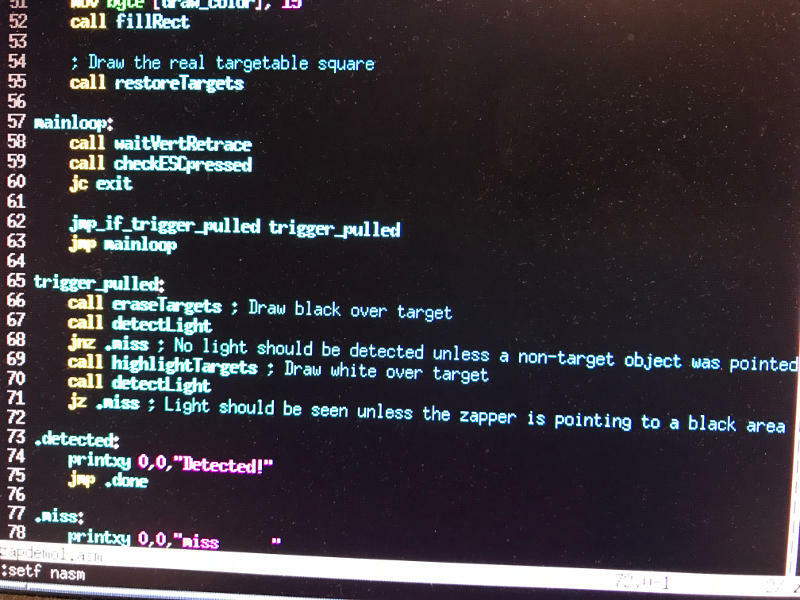 When the test detects that the target has been hit, it writes Detected! in the corner. Otherwise it is simply miss that is written. 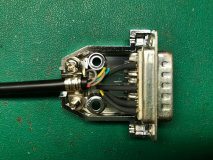 It works very from point blank to about 1.5 meters. From farther apart, it becomes difficult to register hits. Either the target is too small, or the screen is not brigt enough, maybe both. Note: This test program will be included in the final release bundle including source code. Ok, now enough experiments, I have a game to finish and RC2018/04 is almost at its end. 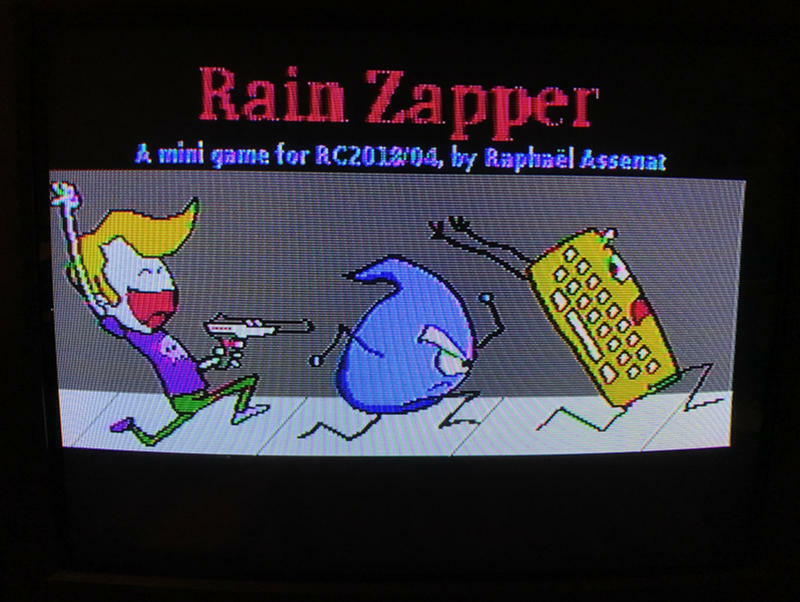 But I will probably make VGA version of the game too, with mouse support for computers not equipped with a Zapper (and DOSBox). This weekend I worked on various finishing touches to the droplet zapping game (and decided to call it Rain Zapper). First let's talk about the main addition, the title screen. I scaled down the image and redrew the outlines. 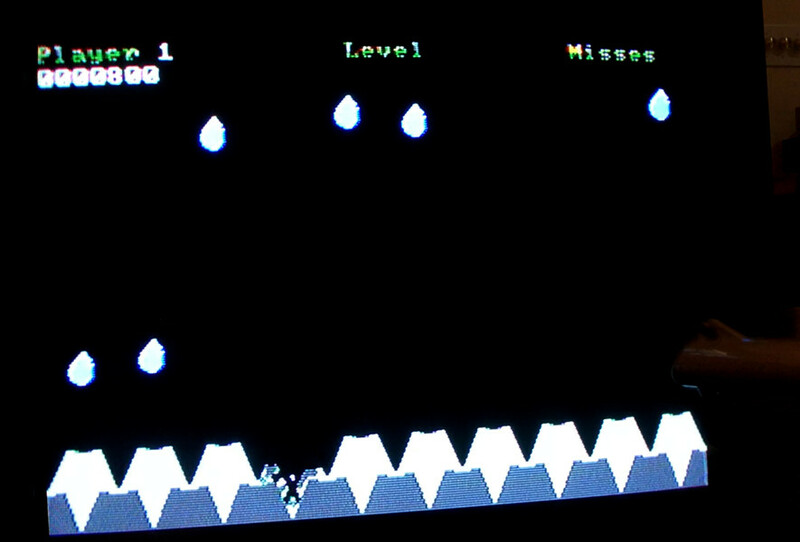 To avoid the apperance of NTSC color artefacts, I avoided thin (1 pixel wide) black lines on white. Oh? What about my yellow? And what's the deal with the green on the pants, it is almost white? 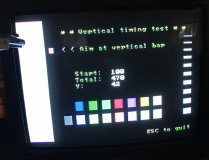 I don't know if this is the "normal" result one obtains when using the Tandy 1000 EX composite video output. 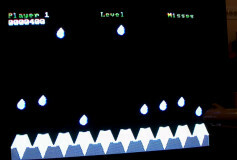 Of course this would not happen with a CGA screen, but I don't have one. To obtain yellow, I had to use brown (also known as Dark Yellow on some monitors). For the green issue, I simply used Dark Green instead of Bright Green. 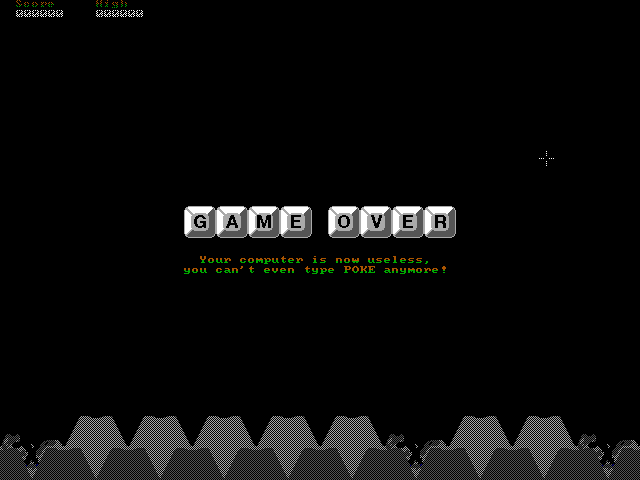 Besides the title screen, I also corrected minor details such as a partially covered score (too close to the edge), I implemented gradual speed and difficulty increase, the best score is now displayed (but only stored in RAM) and an ASCII banner is shown when quitting the game. 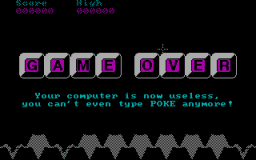 Also, there is now a Game Over screen. 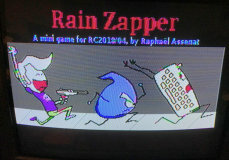 I have a VGA version in the works, where one can play using a mouse or a Zapper. At the moment it uses the Tandy artwork (meant for 320x200) but the playfield dimensions and number of keys are automatically adjusted. It remains to be seen whether it will work well with the Zapper, given that the targets are half the size in 640x480. If it is a problem, bigger artwork could solve it. Otherwise, the white square that's drawn over the targets during detection could simply be enlarged. The VGA and CGA versions (the later does not even exist yet) will be available in a few days/weeks after RC2018/04 ends. There are only a few hours left in RC2018/04 so my priority is the Tandy version, as it is one of my main objectives. 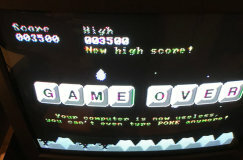 Displaying instructions below the title screen, such as "Pull the trigger to start playing!" and "Press ESC to quit". Additionally and only when a mouse driver is present: "Click left mouse button (... to start)". 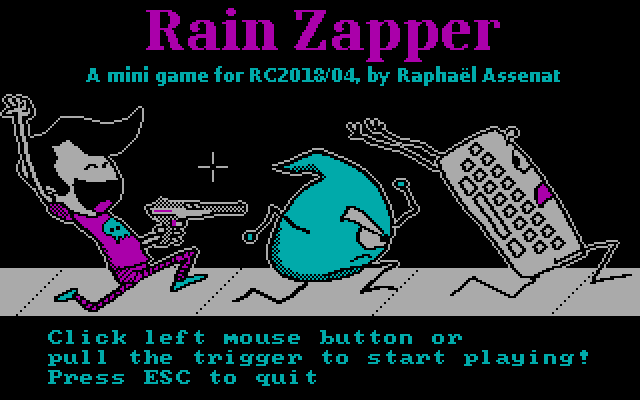 Enabling Zapper or Mouse mode depending on the action done by the user at the title screen. Dismissing the game over screen by pulling the trigger instead of pressing space. Prevents a trip to the keyboard. 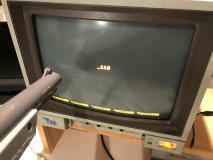 I had some issues with the game on the Tandy 1000 EX. When I called interrupt 33h (mouse driver) the screen would fill with random characters and the system would crash! 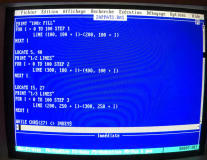 I looked at the interrupt vector using DOS' DEBUG.COM command and saw that it was set to 0000:0000... Since I don't have a mouse driver (nor mouse) on this machine, this must be how the BIOS or DOS 2.11 setups things. In the end I simply added code to detect this situation and avoid a crash. Ah the joy of debugging at the last minute! rain.com (28K) : The game « Rain Zapper » presented above. zapdemo1.com (14K) : The simple test from April 9 with two white squares. 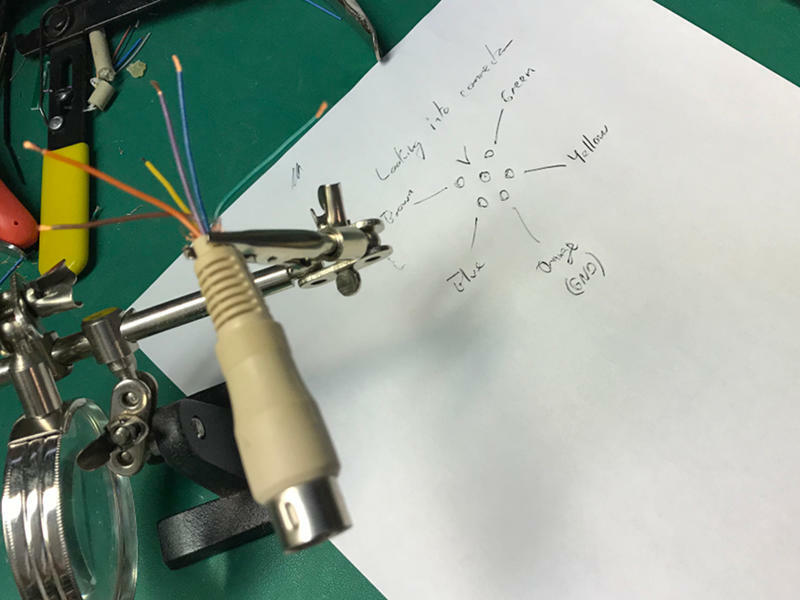 Useful to test your adapter if you build one. zapdemo2.com (14K) : The test for measuring the Y value using timing. Useful to test Zapper performance on different colors and with different line widths. IMPORTANT: All files in this release require a Tandy graphics card, such as what is built into the Tandy 1000 EX. 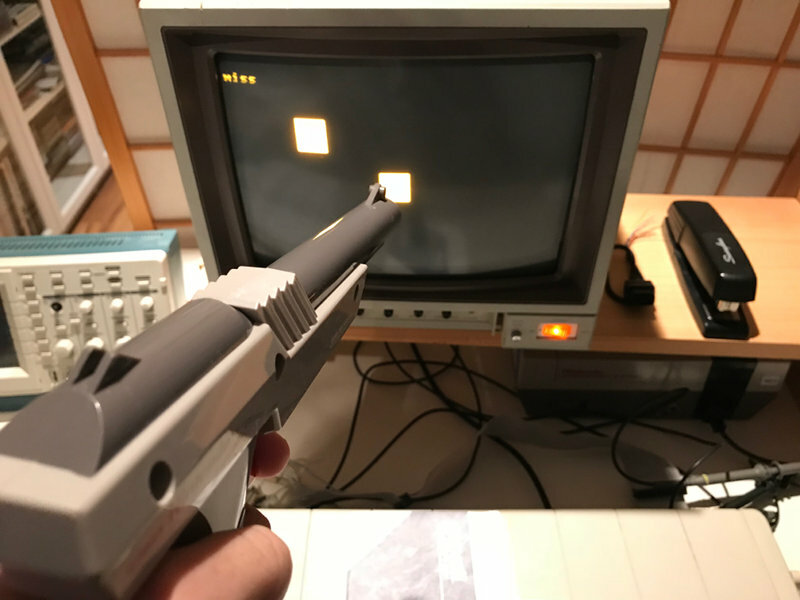 It won't work on CGA, EGA or VGA. 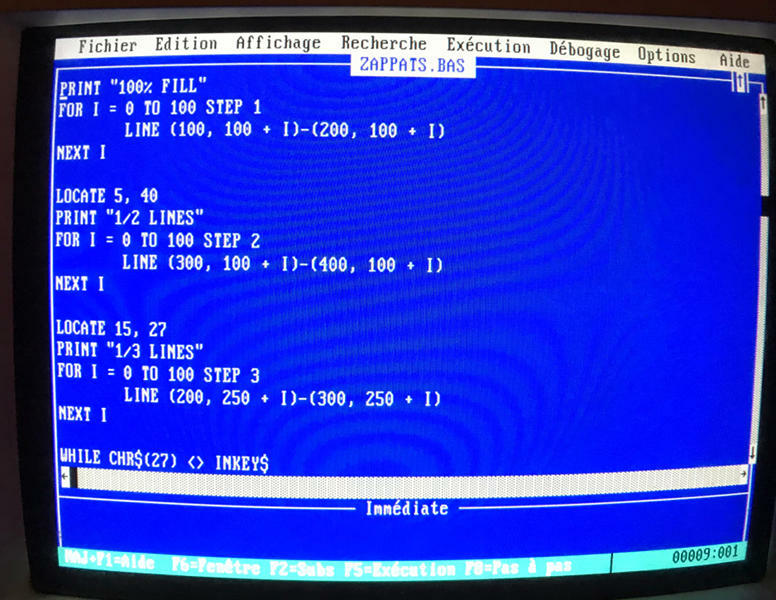 If using DOSBox, use 'machine=tandy'. 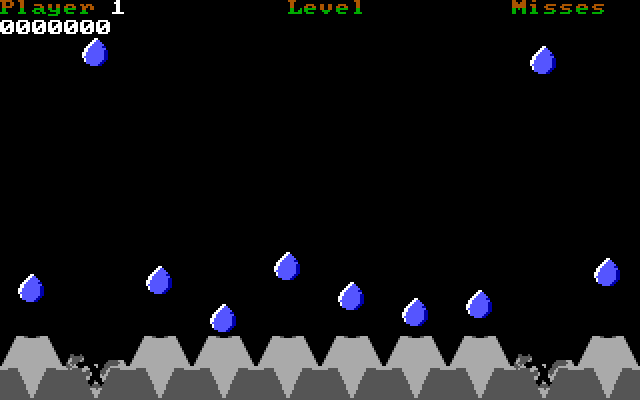 Note: The mouse pointer is buggy in the old version of DOSBox included with debian. It clobbers on-screen graphics and reports incorrect X coordinates. But what about CGA, EGA or VGA!? Yes, but in a few days! 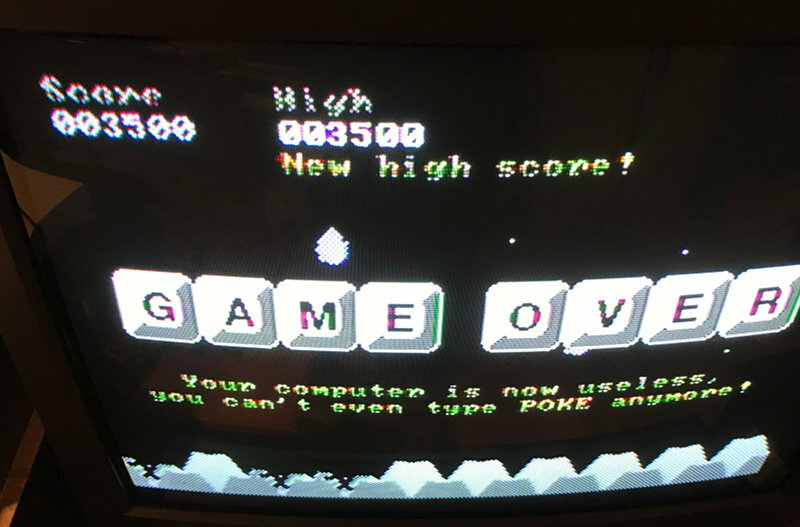 CGA was only a secondary objective (i.e. It was a nice to have) and VGA I did not even know it could be done. Now available! See below. Ready to try the game!? 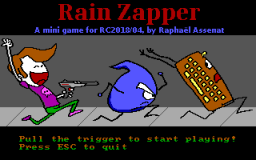 The game Rain Zapper is available below. For the source code, see the GitHub repository below. 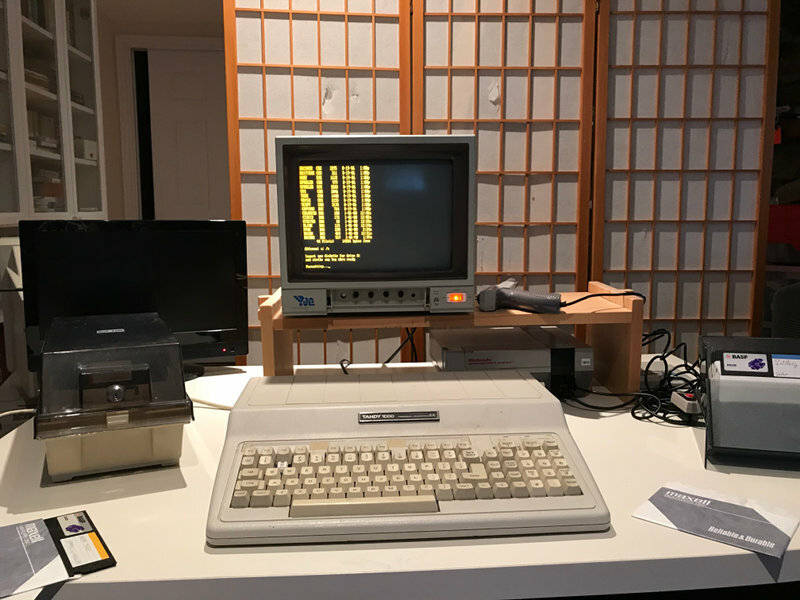 Version 2, now for Tandy, CGA and VGA! Yes! This was an essential element, and I took care of it in the first week. Yes! In the end, this is an or, not an and. 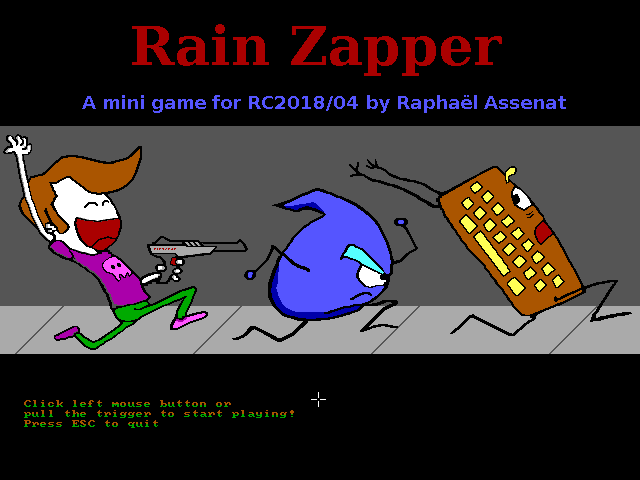 I did a simple mini-game where one must save his keyboard from falling droplets by zapping them. Yes! Nothing too difficult here, it was not the first time I used this mode. In fact I simply reused code from RATillery. Yes!. My experiments show that it is doable. Of course we are speking of a VGA CRT, not LCD. 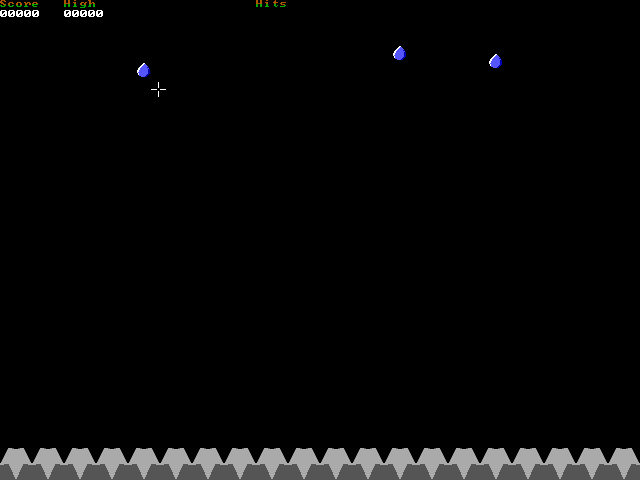 The goal was only "experiment a bit", but I did a bit more: I have a VGA version of my game almost ready! Yes!. 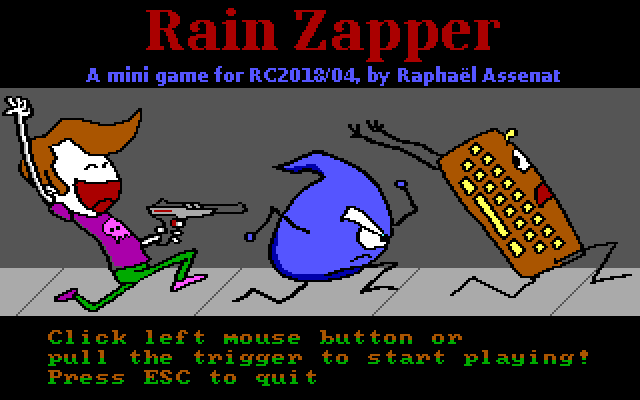 The game does support mice, perfect for playing in DOSBox or on systems not equipped with a Zapper adapter. Will I participate next time? Absolutely! If I can, I will! 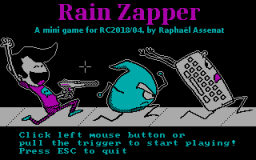 When RC2018/04 ended on April 30 I had not yet had the time to finish the CGA and VGA versions which would make it possible to play with a Zapper also on non-Tandy systems. 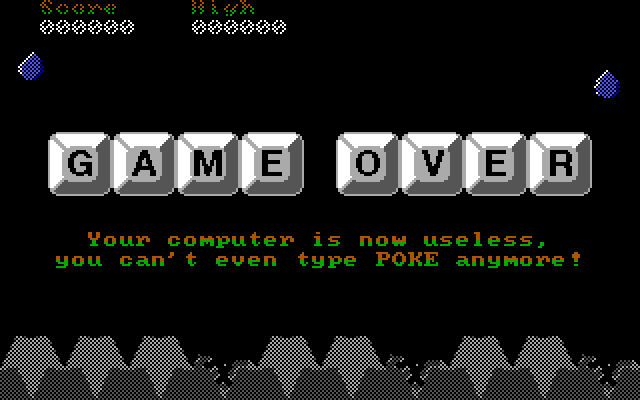 But I worked on it for the last few weeks and finally have CGA and VGA versions available! I edited the graphics to use only 4 colors. The title screen was quite challenging, but I learned nice techniques such as the use of double borders in some places, notably around the keyboard, otherwise the black arms would have been invisible on this black background. 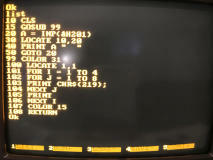 Programming was a simple matter of using my CGA library (The one I made for RATillery) and recompiling. 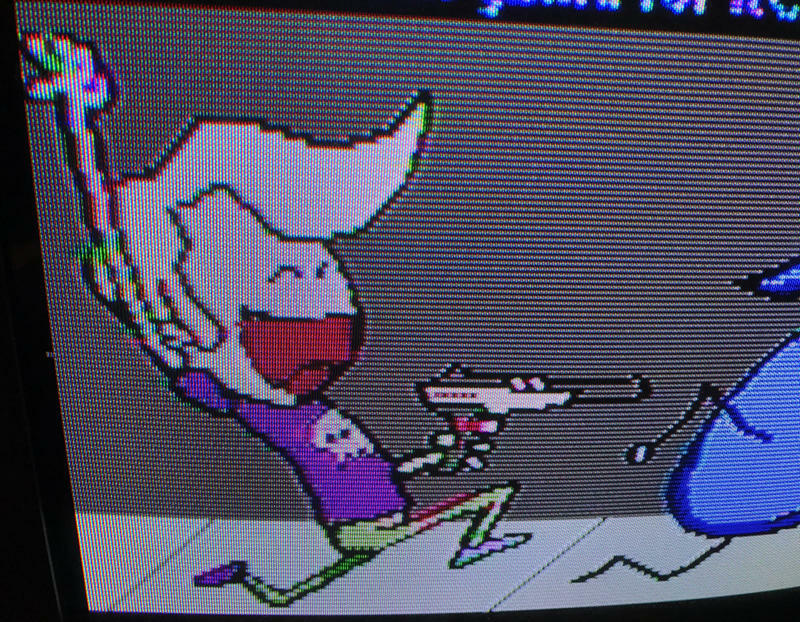 I chose to use the Cyan/Magenta/White/Black CGA palette since it is the only one with a color suitable for the water (Cyan). Right now, the low intensity version of the palette is used. I have not had any issues, but on a darker monitor, the Zapper may not receive enough light. If this happens, enabling the high intensity palette during detection could be a good solution, as it would also provide a flash effect. This version required a lot more work since VGA programming was a new thing for me. I use mode 12h (640x480, 16 colors), a planar mode, which is completely different from the CGA and Tandy modes I had used so far. But thankfully, what I needed to know was clearly explained in the Graphics Programming Black Book. 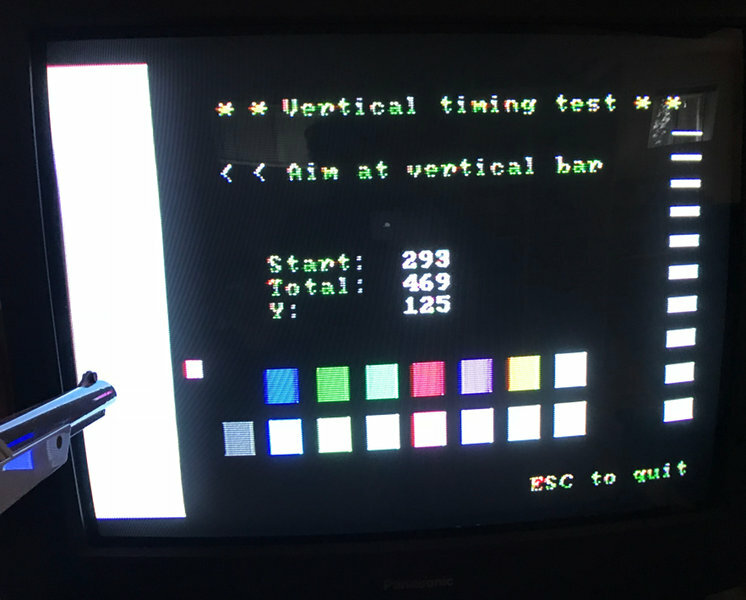 By default, the 16 color VGA palette is identical to the 16 Tandy colors. 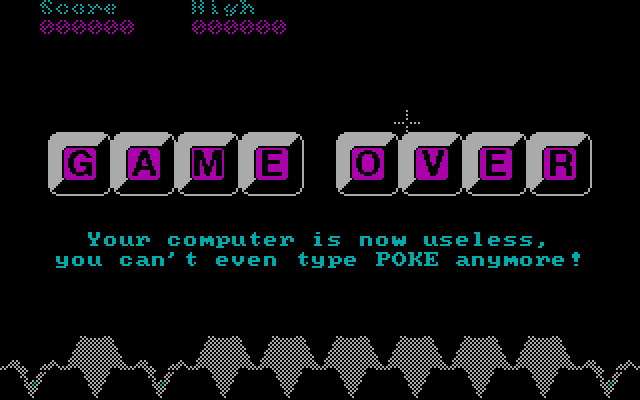 I decided not to redefine them, in order to use reuse the Tandy Graphics. 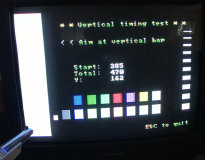 On April 29 I posted a screenshot of a prototype VGA version showing a play field where the quantity of keyboard keys to protect was doubled (doubled due to the switch from a width of 320 pixels to 640 pixels). 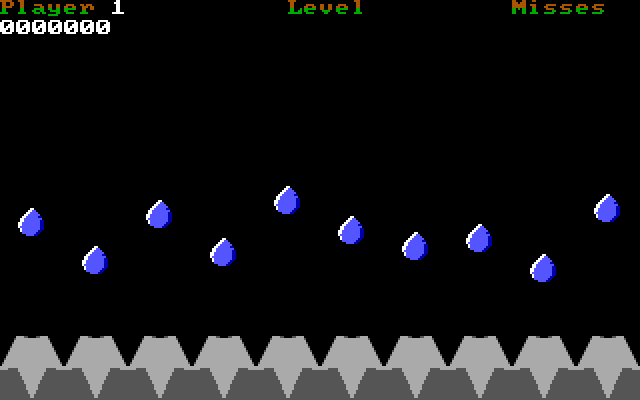 But just as I thought, the droplets were too small and very difficult to hit. To solve this, I resorted to doubling the size of everything. 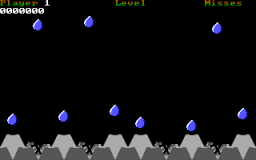 The keys that were 32x32 are now 64x64, droplets that were 16x16 are now 32x32, and so on. And as I wanted to make good use of the extra resolution, I spent a lot of time adding pixels to smoothen the curves, round some areas or increase details. I think I may have spent a few hours on the title screen! 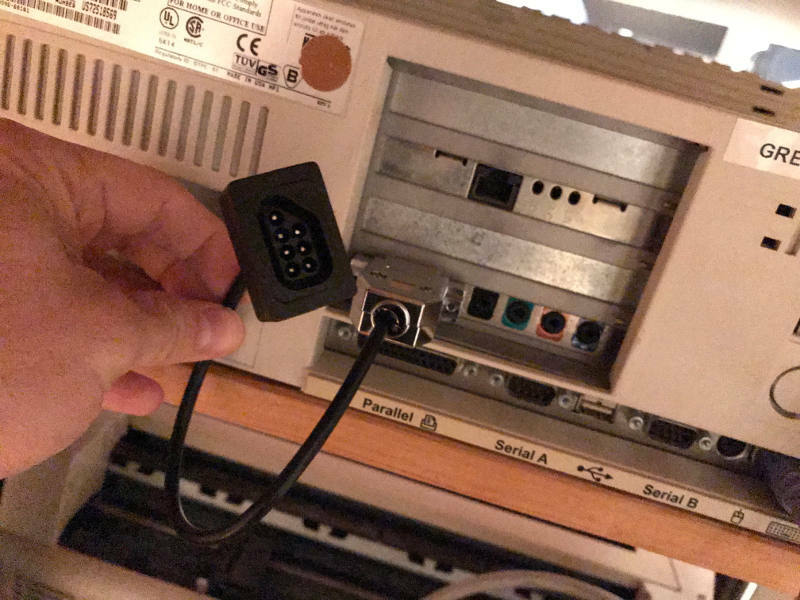 This version works perfectly well on my 386SX (the slowest computer I own that has a VGA card) with the Zapper to DB15 adapter. 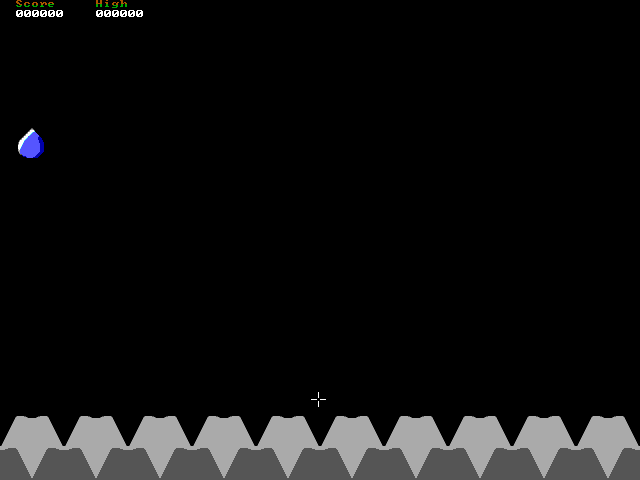 However in mouse mode, the mouse pointer disappears in the top part of the screen. What happens is that the game hides the pointer when redrawing objects that moved. When the pointer is shown again, the screen is already being scanned and if the beam position is lower than where the pointer is, the later is invisible. I still need to speedup my drawing code, and this is not impossible! Right now, when droplets are drawn, data is copied from system RAM to video RAM. It would probably be faster to store the droplet off-screen in video RAM, then use the VGA latches to copy 4 bytes using a single byte read+write. Another potential optimisation: The game could manage drawing the mouse pointer by itself instead of repetitively calling int 33h. The mouse pointer could then be stored in video ram. I'm not sure if the mouse driver does that. Probably not. See the releases section above. 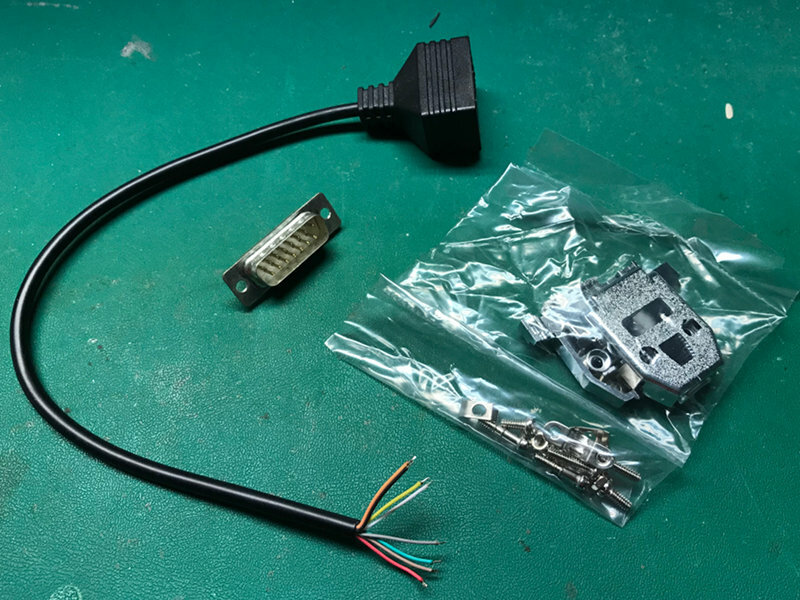 I will publish the schematics for the adapter, as well as the source code for the demo game. The following disclaimer will apply.